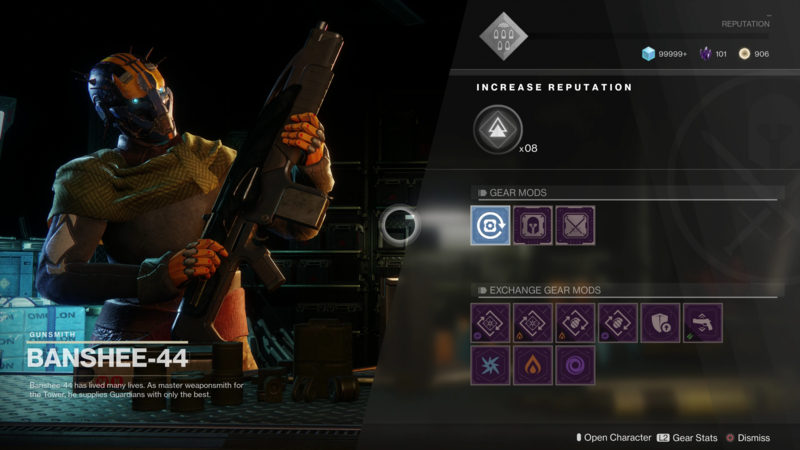 All the Destiny 2 Legendary Mods that you can find within the game are bound to help your character increase their Power level, no matter which stage you're at in the game. In this Destiny 2 Mods guide, we'll be walking you through all the best Destiny 2 Mods, for both your weapons and armor. But if you instead need anything else related to Destiny 2 that isn’t about legendary mods, including guides on how to get every Exotic weapon in the game, as well as a complete walkthrough of every current Crucible map, head over to our Destiny 2 guides walkthrough hub. Firstly, you'll need to know how to get your hands on Legendary mods in Destiny 2, before we actually delve into which are the best ones in the game. You'll need to go to Banshee-44 in the Traveler social hub, but to get to this endgame social hub you'll need to have beaten the campaign of Destiny 2. Banshee-44 is back in Destiny 2, and he's as moody as ever. Once you're in the brand new social hub, you'll be able to access the inventory of Banshee-44, including his Legendary Mods. But, there's a catch here, as Banshee will only sell you Legendary mods if you're at least Power level 280. For more info on how to increase your Power level as quickly as possible, head over to our complete Power level guide. But why are we focusing on the Legendary mods specifically, over the Rare counterparts? Well, although both Rare and Legendary mods provide bonuses to your Mobility, Resiliance, and Recovery stats, only the Legendary mods increase the overall rating of the piece of gear that you equip them to. This means that Legendary mods will increase the overall Power level of your character, whereas Rare mods won't. As you can see in the video just below covering Legendary mods, you actually can stack mod ability bonuses on top of one another. This means that you can have three mods equipped for three different pieces of gear, that will all, for example, decrease the amount of time it takes for your grenade to recharge. With weapon mods, you always want to make sure they give your weapon an elemental attack, and it'd be best to have a range of Arc, Solar, and Void mods equipped for weapons in each of your three slots. This works wonders for when you come up against an enemy that is weak to a certain type of elemental damage, as you can simply switch to whichever weapon has that elemental Legendary mod equipped to it. As for the armor mods, you generally want to try and focus on balancing out your Mobility, Resiliance, and Recovery stats for your character. Having Legendary mods that boost any of these stats is always a good idea, as it ultimately leads to a character that is well rounded and excellent in any situation. Aside from this, you'll also want to keep an eye out for armor mods that can boost the handling or reload speeds of any of your equipped weapons. For example, you might have an auto rifle in your energy weapon slot that you love to use in the Crucible, but can be a bit inaccurate and unstable when firing. An armor mod that increases the stability or handling of your equipped energy weapon is therefore going to work wonders for this auto rifle.